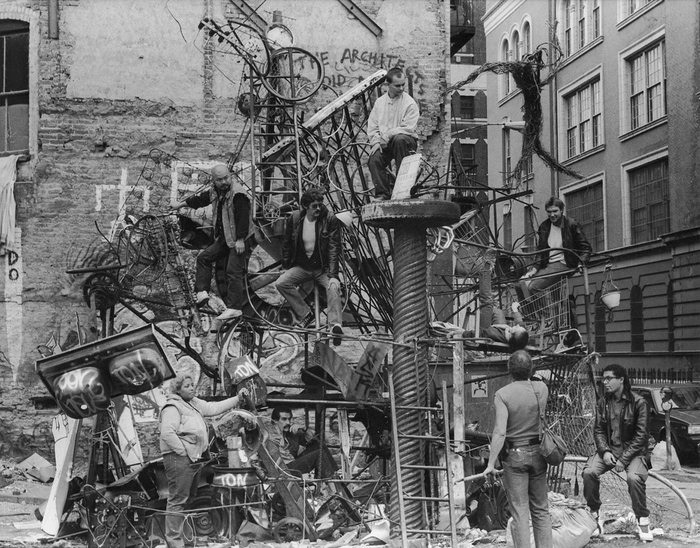 Back when New York’s Lower East Side was a car crash no-go zone, full of abandoned lots, cheap rents, squatters and wannabee musicians and artists, a group of sculptors, painters and performance artists took over a patch of earth and turned it into a sculpture garden. Welded metal grew over towed cars and rubble; a metal arch served as a rusty rainbow, aerosol and end-of-tin paint turned it all kaleidoscopic. Then there were music and poetry performances in, on and using the sculpture, then new indoor spaces nearby. Clubs and performance nights, rants and readings, one off concerts occurred in orbit around the playful energy that the self-styled Rivington School group seemed to accumulate around themselves. Of course, there were evictions, demolitions, fights and disagreements, (the sculpture garden had to be rebuilt elsewhere) and until now what went on in lower NYC has been lost to what Jim C. here calls ‘the dung-heap of history’. He talks about the ‘unscripted drama’ of the place, where every nickel and dime had to be eked out to buy the most basics of food or tools, and art materials were what could be borrowed, found or stolen in the streets around them. These people were social warriors, allowing a scene to erupt from where and how they lived, long before artists followed by gallery owners followed by real estate buyers moved in to tidy up the area. Istvan Kantor has curated an astonishing set of documents, writing and photographs here, which manage to catch some of the enthusiasm, the rawness and excitement, of what was going on in the 1980s. It captures both the artistic and social scenes, as well as the self-delusion, the self-importance, the selfishness, the revolutionary fighting spirit that enabled work to be produced without money, and the group’s ability to celebrate and party, to entertain themselves and anyone else prepared to come along with an open mind and heart. I suspect, however, you had to be there. The book works hard to show the diversity of what was going on, the writing – often itself raw and sometimes muddled: memories and thwarted ambitions seen through drink and dreams – laments and mourns the scene these people lived in and lived for, but in the cool light of 21st century what is left is naive urban art, clearly situated within the emerging worlds of graffiti and punk in New York City. One of the manifestos reproduced here says REVOLUTIONARY ART IS OF NECESSITY CRIMINAL, and whilst – if you want to locate it within city statutes and laws – the art here probably was criminal (whatever that means), it’s hard to see it as revolutionary beyond the means of production and its situation . If this sounds disparaging, I don’t mean to be. 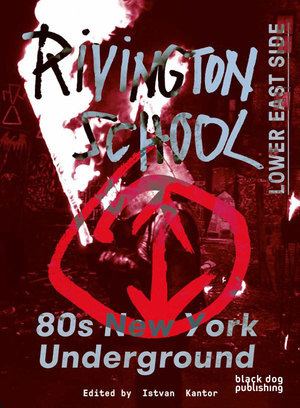 We need reminding to reclaim the streets, reclaim the arts, reclaim our lives, make art where we are now, just as the Rivington School did back then. This entry was posted on 12 January, 2017 in homepage and tagged Istvan Kantor, New York's Lower East Side, Rivington School, Rupert Loydell. Bookmark the permalink. Cool to see this in the International Times today. I remember IT from way back in 1977 when a friend brought it back to NY from London.